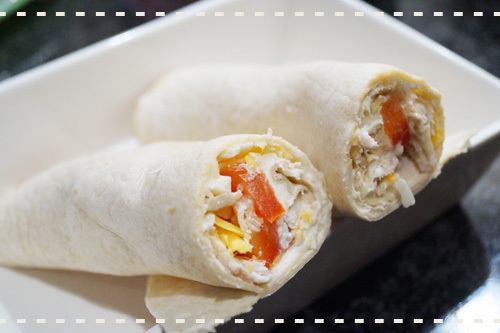 These cheesy turkey low-carb wraps are one of our family favorites - they are easy, pretty, and taste so good. Everyone who tries our turkey wraps is so impressed. When we have friends over, their response is always great. And all you need is a handful of simple, nutritious ingredients to make them. The cheesy wraps are simply irresistible and a great choice for a kid's party. You can serve with celery sticks or fresh, seasonal veggies for a healthy meal. Serve in a big platter with cherry tomatoes and greens to impress your guests. Spread a thin layer of the cream cheese on the tortillas. You can substitute with yogurt if you like. Arrange the turkey cubes in a row and top with the cheese blend and finely chopped red pepper. Roll each tortilla up tightly and cut the wrap in half. Chill for 2 hours or serve immediately with a tablespoon of heavy cream on the side.